Theatre Peckhams’ Business Brunch is a 4-part quarterly event, hosted at Theatre Peckham in partnership with Camberwell Business Network where local and corporate businesses can come together build relationships, develop networks, share best practice and exchange skills in the heart of the community where creativity and innovation thrives. 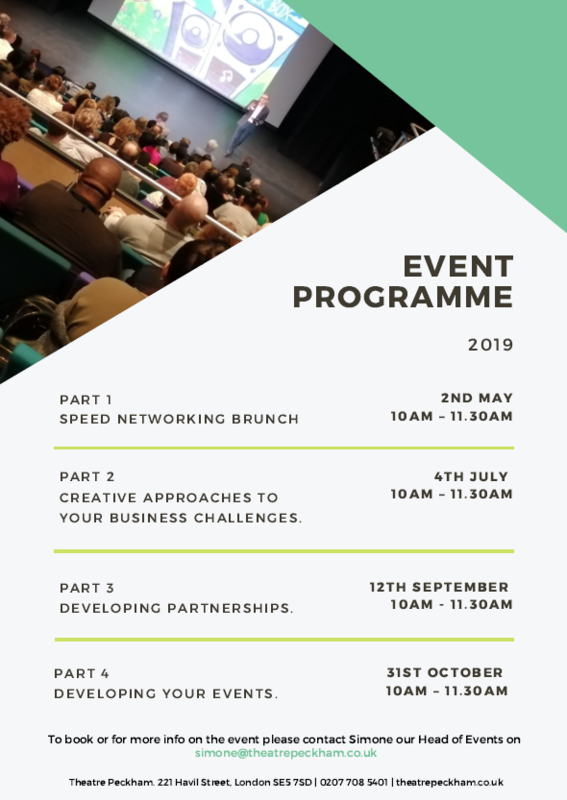 Theatre Peckham will host you over brunch and facilitate conversations on how we can work together to make our business community more agile, more responsive and more connected. Receive information on events organised by Southwark Council for local business in the area to troubleshoot issues, disseminate info on council led events and initiatives that effect your business. Develop partnership opportunities with local business and corporate organisations. Have a free breakfast / brunch once a quarter. We will offer free space here at Theatre Peckham throughout the day where you can meet with business brunch peers to develop your partnership ideas and discuss next steps or simply come and hang out in our café and enjoy Brunch with us. We have a limited number of spaces available at each event, so please RSVP to book your space. Tickets are FREE, however you will need to secure your place with a £10 deposit. Deposits will be refunded on attendance of the event.